Welcome to part two of our off-roading tips for beginners at TopLift Pros. 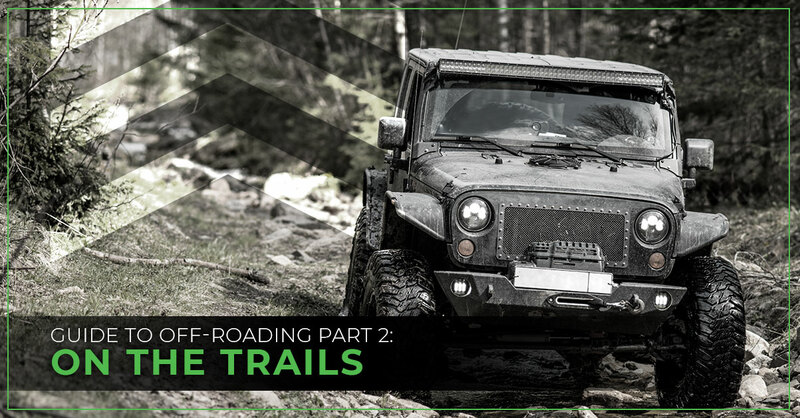 Now that you have learned many of the essential ways to prepare both you and your Jeep for off-roading from part one, we will dive into how to approach handling the big day — your first day out on the trails — so that your first experience off-roading in your Wrangler is an unforgettable one and certainly not your last. Whether this is going to be your first-ever off-roading endeavor or simply your first time on a particularly tricky trail that brings forth new challenges to your off-roading game, follow these essential tips in order to get the most out of your ride. If you truly want a next-level off-roading and Jeeping experience as a whole, get your hands on a TopLift Pro or Jeep Store-A-Door cart in order to get the most out of your days on the open trail. While it may be hard to hold back your urge to go full send down the first trailhead you see, it’s best to take a considerate amount of time to analyze the conditions that lie ahead of you to thoroughly get a grasp on what you’re planning on getting yourself into. To be best prepared, you should research the conditions of wherever you are planning on heading for your day of off-roading prior to your departure including the trail conditions, potential closures or hazards, and, of course, the weather. Getting your Jeep stuck on a trail is rough enough on its own without adding a high-altitude thunderstorm into the mix. You can search online and more than likely find a few maps in order to learn the geography and terrain before your arrival. This will help you be fully prepared for your journey and guarantee that you won’t end up putting your 4x4 through something it is not equipped to handle. Some trail obstacles require specific off-road Jeep accessories, so it’s important to know what your 4x4 can handle and what it cannot, which if you followed the preparation tips in Part 1, you should already know! If it turns out that there aren’t many good maps available for your destination, you can still explore on foot upon your arrival to get fully acquainted with the landscape. Especially if this is your first time ever experiencing the unique thrill that only off-roading can provide, you’re in for a rough ride. So it’s best to get your seat adjusted to our liking in a relaxed, upright position with a loose grip on the steering wheel. If you anxiously grip the steering wheel too tight in what’s known as the “death grip,” you will soon regret it as the rough terrain will inevitably jerk your wheel back and forth as you make your way across it. Overall, the hardtop Jeep Wrangler was made for those who do the majority of their driving in an urban atmosphere, not for off-road usage. So when attempting to tackle any trails that are even the least bit rigid or inclined, you will want to remove your hardtop prior. Your precious hardtop was not meant for rollovers, and it’s brittle and expensive SMC fiberglass makeup will undoubtedly break upon any impact with the ground if you choose to attempt off-roading with it still intact. Lucky for you, though, you have your TopLift Pro, the quickest and easiest Jeep hardtop hoist around, meaning you can get all of the perks of a soft top Wrangler when it comes to your off-roading adventures. And if you don’t, you should order yours before they’re all gone! Trekking off-road can be just as dangerous as, or even more than, bench pressing some heavy weights, which is why it's only logical to have a guide or spotter to help you navigate through tough terrain and obstacles. When you’re a first-time off-roader, this qualifies for just about every obstacle in your path. A spotter is an essential part of off-roading as they can see potential damaging situations before you can in the driver’s seat in many cases and prevent damage to your precious Jeep. 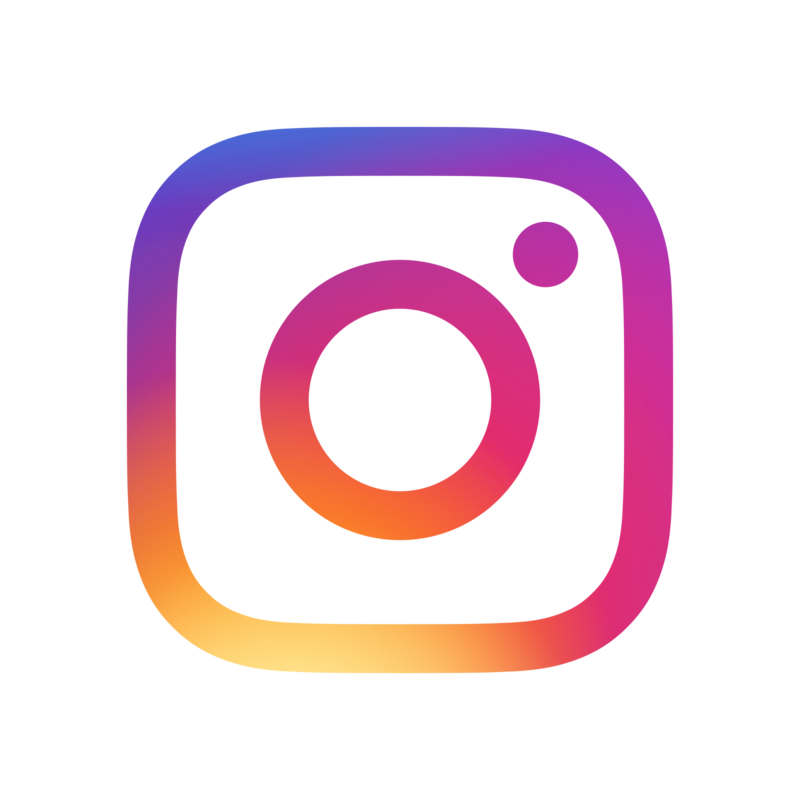 Knowing your angles is another factor in off-roading that certainly takes some practice and a learning curve, yet it is incredibly important in order for you to have the best riding experience. There are three types of angles involved with off-roading to always be conscientious of: your approach angle, departure angle, and break over angle. A break over angle is the maximum possible angle in which your vehicle can shoot over a gap without it making contact with the undercarriage or any other aspect of the vehicle outside of the tires. Your Jeep Wrangler is not like your old six-speed. You do not need to ride with your left foot on the clutch pedal. When hovering over the clutch on bumpy terrain, not only will your leg become incredibly sore, but you can also risk punching the clutch at inopportune times which can lead to a multitude of undesired scenarios. When you aren’t switching gears, keep that foot on the dead pedal to help support your body’s weight against the Jeep’s movement. Never punch the pedal; no matter what. Always ease gradually into the throttle with caution as this helps your tires keep traction. If you give it too much punch at any given time, this can send you into a wheel-spinning frenzy leading to your Wrangler getting stuck by digging into the cracks and crevices. While you should never be punching the throttle, you should be giving it a sufficient amount of gas in order to keep the momentum required to overcome the drag of your tires on the softer surfaces of trails. This constant churning helps keep traction and prevents your Jeep from getting stuck. So, overall, if you apply too much gas, you get stuck, and if you don’t apply enough gas, you also get stuck. It may sound like a lose-lose scenario, but these are lessons that only experience off-roading will teach you as you will learn what the ideal balance is for your Wrangler. Plus, this is why you brought that tow strap or winch along for the journey that we discussed in part one. While for first-timers, we certainly don’t advise taking your Jeep surfing, if you have your heart set on getting your Jeep a fresh coat of mud, always know the depth of the body of water before you make any attempts to take your Jeep across a lagoon, creek, pond, or puddle of any kind. If you don’t, your surfing Jeep might quickly evolve into a submarine, or worse, it can succumb to surprises waiting under the surface such as giant boulders, fallen trees, and a variety of other potentially-damaging factors. 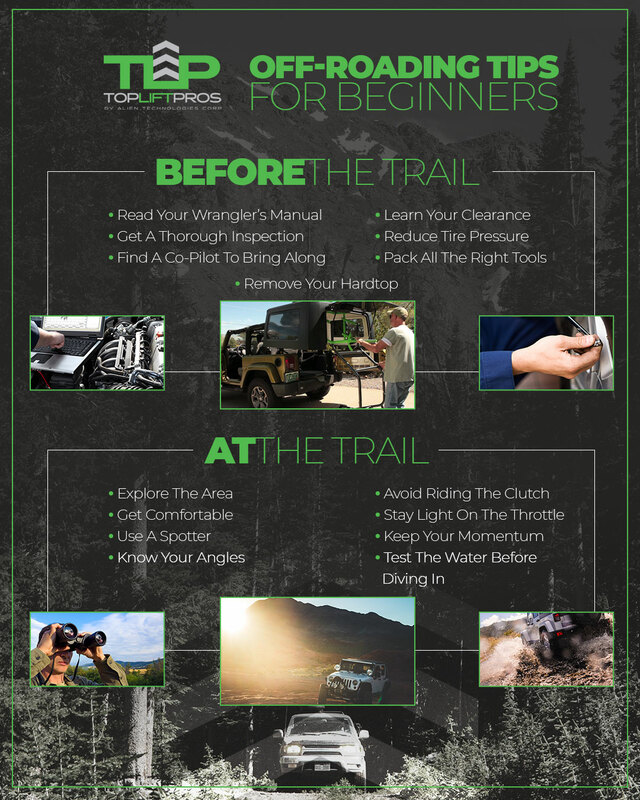 Thanks for taking a look at our tips for beginning your off-road ventures the right way from the team at TopLift Pros. We hope that you will take these items to heart and put them into practice as you go about getting the most out of your Jeep Wrangler. If you’ve been in search of an ideal Jeep hardtop hoist for removing your Wrangler’s roof, pre-order our Top Rated National® Jeep hardtop removal solution today, the TopLift Pro.